Series three of high-concept US post-apocalyptic drama The 100 premieres in the UK on the E4 Channel at 21:00 on Wednesday 17 February 2016. The series follows the exploits of one hundred juvenile prisoners who are exiled from a failing space station (‘the Ark’) and returned to the abandoned planet earth to see if it might be habitable once again. Executives for the AMC network have confirmed that the putative spin-off series for the hugely successful post-apocalyptic zombie serial The Walking Dead will be going into production, probably arriving on US and UK TV screens in 2015. The show’s creators shared their plans with the BBC’s Newsbeat (6 September). “There are many corners of The Walking Dead universe that remain unseen in the shadows,” said Robert Kirkman, the creator of The Walking Dead comic books. The fourth series of The Walking Dead delivered the strongest ratings ever for the show, reinforcing its position as one of the network’s strongest performers. 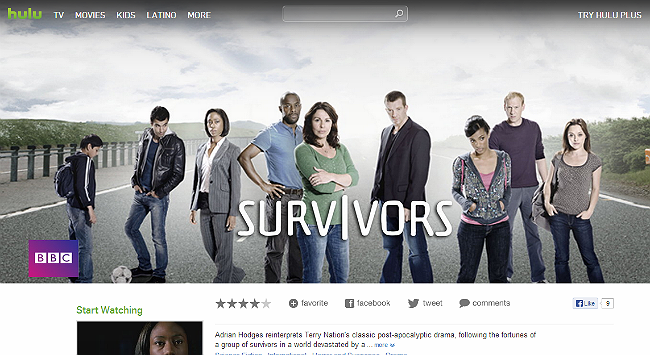 It is currently the most-watched post-apocalyptic drama on TV. Series five of The Walking Dead will begin screening on the Fox channel in the UK on Monday 13 October 2014. Loss-of-electric-power TV series Revolution has been the latest high-profile post-apocalyptic TV drama to be axed, being dropped by the NBC network after completing its second season run. After a strong initial showing, with 11.65m million viewers tuning-in in the US for the series’ premiere in September 2012 Revolution had struggled to retain ratings – particularly as season two progressed, slumping to less than 4m. 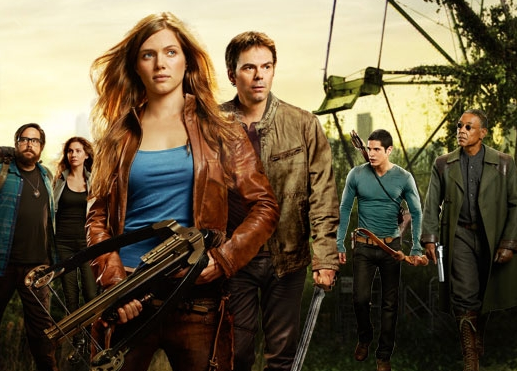 Fans of Revolution have launched a campaign urging NBC to reverse the cancellation decision, or to release the series to an alternative broadcaster willing to continue the show. Series four of alien-invasion post-apocalyptic drama Falling Skies premiered in the US on 22 June 2014, and will be shown on the FX channel at 21:00 on Tuesdays beginning 15 July 2014. At the end of season 3, Tom Mason (Noah Wyle) and the 2nd Mass scored their biggest victory of the war to date with the destruction of the Espheni mothership in Boston, thanks in large part to the Volm. However, the Volm subsequently kicked the humans out of their own war and tried to deport everyone to Brazil for the duration of the fight against the Espheni. Only the personal intervention of Cochise prevented that from happening. But Tom Mason may soon wish that he had accepted the offer to escape the war. The CW network has commissioned new high-concept post-apocalyptic teen drama The 100. Following a positive reception to the first thirteen-episode season (which premiered in the US in March 2014), the CW renewed The 100 for a second series which will screen in the US in October. In the UK, The 100 will premiere on E4 at 21:00 on 7 July 2014. The 100, is set 97 years after a nuclear apocalypse decimates civilisation on Earth and the show centres on the survivors aboard their Ark in space as they struggle to manage a growing population. The only survivors were those who had chosen to live on twelve space stations which orbited the Earth prior to the war, and a handful of “grounders” who managed to escape the planet before its downfall. In the aftermath of destruction, the residents of the space stations joined their crafts together to form a single massive station named “The Ark”, where about 2,400 people live. The only hope of survival for humanity is to discover whether the planet has now become hospitable – so 100 of their juvenile imprisoned convicts are dispatched to Earth to discover what awaits them. Will this be a chance for the young people to start living life to the full, or will what they find on the ground prove to be even more deadly? Premiering in the US on 22 June 2014, TNT’s The Last Ship is a ten-episode post-apocalyptic serial which focuses on the efforts of a crew of fictional US Navy ship USS Nathan James (DDG-151) to survive in the aftermath of a pandemic which has killed more than 50% of the world’s population. The lone destroyer must also search for a vaccine which can protect the survivors from the continuing threat of the virus. This new ten-part HBO post-apocalyptic show from Lost creator Damon Lindelof is high-concept fantasy, which follows the dilemmas of the residents of Earth who are left behind after a ‘rapture’-like event which sees many of the world’s residents disappear. The show premiers in the US on 29 June, but does not yet have a broadcaster in the UK. Cast members include Christopher Eccleston (The Doctor, Doctor Who) and Paterson Joseph (Greg Preston, Survivors 2008-2010). After a well-received pilot, Amazon commissioned a full first season, which will be available exclusively online from the Amazon Video service. The full pilot episode is available to stream free-of-charge from the Amazon Video service (in the UK and the US). The Victorian crime drama Ripper Street, cancelled by the BBC due to falling viewing figures after two series, is to return to BBC screens for a third series following a deal with Amazon. The announcement of the deal with Amazon’s Prime Instant Video service delighted fans of the series who had been lobbying the BBC to reverse its cancellation decision. Amazon will cover the majority of the production costs, in return for the rights to premiere the series on Prime Instant Video. The BBC will retain the right to broadcast the show on BBC One some time later. Co-funding arrangements with BBC America and the Irish Film Board will also remain in place. The BBC indicated that series three would retain the previous eight-episode format, and be produced on a similar budget to the first two series. Similar deals of its kind are not expected to follow. However, Amazon’s Tim Leslie said if audiences loved a cancelled show and wanted to bring it back, they would consider it. Actress MyAnna Buring, who plays Long Susan, said fan reaction was “incredibly moving” in response to the BBC’s decision not to recommission the show. “I don’t think without that kind of response everyone would have been inspired to create a deal like this,” she added. The second part of season four of post-apocalyptic zombie serial The Walking Dead premiers (in the UK) on the Fox cable channel at 21:00 on Monday 10 February 2014 (the day after US transmission), continuing weekly thereafter for the remainder of the season. It was confirmed in October 2013 that the show had been commissioned for a fifth series. With only a handful of series four episodes broadcast, AMC has already announced that it has renewed zombie post-apocalyptic TV series The Walking Dead for a fifth series. Making what AMC president Charlies Collier called “one of the most anti-climactic renewal announcements ever”, he confirmed that the opening episode of series four “broke viewership records […] and became the biggest non-sports telecast in cable history.” Given such numbers, non-renewal was simply not an option. In the UK, series four of The Walking Dead continues on the FOX cable channel at 22:00 on Fridays. AMC announced today (29 October) that it has renewed The Walking Dead for a fifth season. The number one show on television among adults 18-49, The Walking Dead returned for a fourth season earlier this month and the premiere episode set a new record for the series, delivering 20.2 million viewers, live+3, and 13.2 million adults 18-49, a new record for any non-sports cable telecast. For Season 5, Scott Gimple will return as the series’ showrunner along with executive producers Robert Kirkman, Gale Anne Hurd, David Alpert, Greg Nicotero and Tom Luse. AMC also recently announced that it is developing a companion series to The Walking Dead, based on a new story and new characters from Robert Kirkman. The tortuous story of the long-running plan to revive and remake Survivors‘ creator Terry Nation’s space drama Blake’s 7 has taken yet another turn this week. In April 2013 it was announced that FremantleMedia International would produce a 13-episode series remake of Blake’s 7 to be broadcast of the cable channel SyFy. This was to be a ‘re-imagining’ of the original (1978-81) show. On Thursday 15 August, the Financial Times, BBC News and Digital Spy all reported that these plans had been shelved. Instead it was announced that the revival of Blake’s 7 would now be funded by Microsoft, with the series airing on the Xbox Live service. The London-based Motion Picture Capital company was reported to have taken over responsibility for the show’s development. However, a Freemantle spokesman told BBC News that it was “not aware of any deal” with Microsoft, while both Microsoft and Motion Picture Capital declined to comment. Rights owner Andrew Mark Sewell told BBC News: “When we have news to report, we’ll let everyone know.” It seems clear that position remains far from settled. Blake’s 7 was the show that Terry Nation created shortly after his departure from the original Survivors at the end of series one in 1975. Later in his career, Nation sought to get an American network to revive Blake’s 7, as he also (unsuccessfully) attempted to do with Survivors. Despite the current popularity of a wide range of post-apocalyptic serial dramas, the genre is still not immune from abrupt cancellations. As a follow-up to the 2009 big-screen, post-apocalyptic ‘zombie comedy’ Zombieland, Amazon commissioned a pilot for an online-only Zombieland series in early 2013, with a view to producing a full episodic spin-off show. The pilot episode is available to watch in-full online (for free) on the LoveFilm platform, and – in the USA – through Amazon Instant Video. Cable television channel AMC has produced a video preview for season four of the acclaimed post-apocalyptic zombie TV drama The Walking Dead, which will be broadcast in the US in the autumn of 2013 (UK transmission dates have not yet been confirmed). The preview which includes ***many series three spoilers***, features interviews with cast and crew, and gives some indications as to the themes and ideas likely to frame the upcoming season. Please be aware that, in keeping with the show itself, the preview contains numerous scenes of gore of horror. TNT have released a two-and-a-half minute trailer for season three of alien-invasion, post-apocalyptic TV drama Falling Skies. Please be advised that the trailer contains ***numerous spoilers*** about upcoming events in the season. The Walking Dead continues to be the most critically acclaimed of the new wave of post-apocalyptic dramas now screening. Transmission of series three paused in the autumn on 2012, and recommenced in February 2013. In the UK, The Walking Dead has been shown on on the Fox channel (previously FX), with new episodes airing every Friday evening. Series three will conclude its UK transmission in April 2013. The AMC cable TV channel, which produces the show, confirmed in December 2012 that The Walking Dead had been renewed for a fourth season. Two spin-off computer games have been released, beginning with Telltale Games five-episode The Walking Dead for PS3, Xbox, and iPad in 2012, and The Walking Dead: Survival Instinct for PS3 and Xbox in March 2013. Renewed in 2012 for a third series, alien-invasion post-apocalyptic drama Falling Skies will return to US TV screens on cable channel TNT in June 2013. It is expected that Falling Skies will be shown in the UK on the Fox Channel this summer. The first in a series of Falling Skies graphic novels was published in 2011, with the follow-up The Battle of Fitchburg following in October 2012. Cancelled post-apocalyptic TV show Jericho is continuing a canonical life in print. A graphic novelisation of ‘series three’ entitled Civil War was published in 2011, with a novelisation of ‘series four’ scheduled for publication in July 2013. The pilot for new post-apocalyptic drama series Revolution broadcast in the US in September 2012, with a further nine episodes showing before the end of the year. After a winter break, the remaining ten episodes of series one began transmission on the NBC Network in late March 2013. The series has been licensed for transmission in the UK by Sky, and the pilot will air on Sky1 and Sky1 HD on 29 March 2013, with the remaining 19 episodes of series one being shown weekly on Fridays. There has been no word yet on the prospect of the series being renewed for a second season.